Well, it’s been a few weeks since I posted anything…Not that nothing’s been happening! 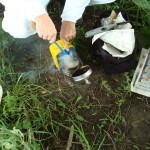 After the merge (13-July), we had a single hive, with five boxes. Two deep, a shallow, another deep, and a shallow on top. I gave the girls a little time to themselves to get themselves re-organized, and I thought everything was fine. 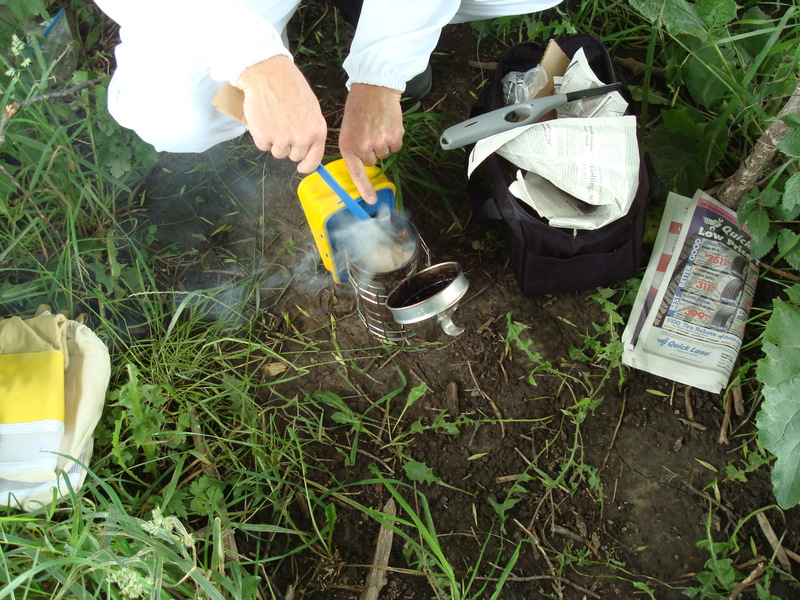 But last week (15-Aug), when I inspected…starting at the bottom, I found no brood in the bottom two deeps. This concerned me a little. 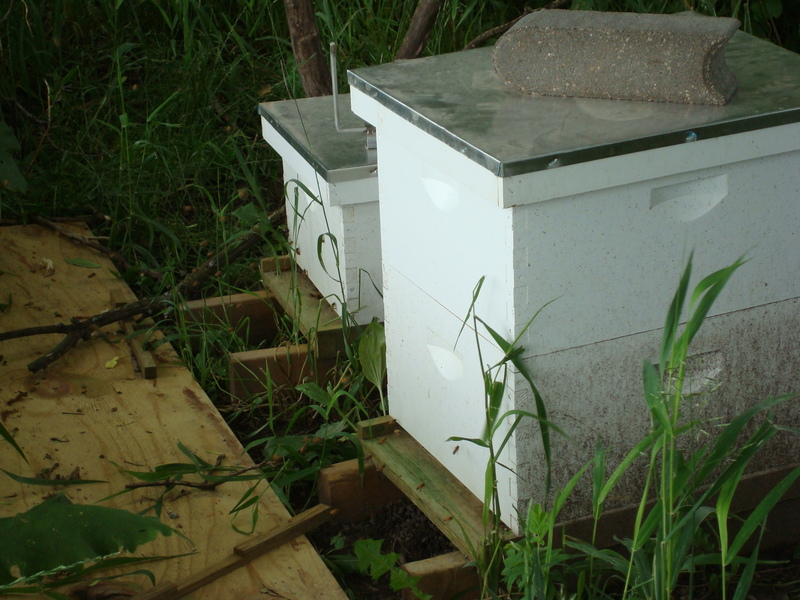 As I worked my way up, I did find that the bees had been packing honey in the second deep, and some in the first deep…but none in that middle shallow box. By the time I got to the upper deep (fourth floor) that day, the girls were NOT happy that I was bee-boppin’ around in there and so, before I had a chance to really go through that 4th floor box, they had made it clear that I was not welcome on that day. So I closed everything up and dejectedly headed across the field for the car (yes I had my keys in the correct pockets this time). So I left with the impression that we had gone queen-less again. The bees’ behavior gave me the definite feeling that they were cranky for being without a queen. I gave them another week, and went in this Saturday (20-Aug) with Cindy and her camera. This time I started at the top and worked down. And what a surprise! We saw eggs and larvae in that top deep box, in a good pattern (all the eggs/larvae close together). By seeing the larva that this particular stage of development (little fat white grubs filling the bottom of the cells) and quite a few cells capped over…it told me that we had had a queen a’laying for at least 9 days on the frames that I was looking at. Here are Cindy’s pictures of the two kinds of frames. 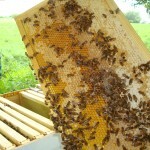 One is glistening with uncapped nectar (almost honey) and the other has the brood. In the brood picture, you can see the fat little bee larvae waiting to be capped over where they’ll grow as pupae for 10 days, before they emerge on or around the 21st day after being an egg. “All right Mr DeMille, Ready for my closeup”…Cindy got some really good pics with the flash! She had her jacket and veil for protection, but this time she really came in over my shoulder to get some good pictures. This is the first time you’ve been able to see closeup what I see when I pick up the frames. But this inspection on Saturday gave me a big relief, when I saw the eggs/larvae. It meant that the girls had a queen! Long Live the Queen! Well, it’s Wednesday afternoon (July 13), and my Mentor Dan Klasen came out to my little beeyard in New Market MN to help me evaluate what’s going on. 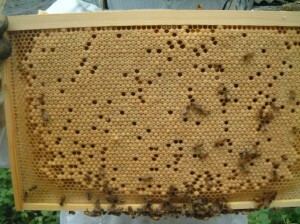 We looked in on the weak (West) hive, and the girls seemed “buzzier” than usual…they just sounded irritated. After spending a few minutes looking for the queen, we decided that the pattern of egg-laying looked crappy, and since we didn’t see the queen…we would inspect East. Those girls in West were cranky BECAUSE they didn’t have a queen. The rest of the inspection of “East” was good. Laying pattern is strong, lots of eggs, lots of larvae in open cells, and nicely capped brood (pupae/cocoons, remember? )…This side looks good! So we made the decision to merge, or unite the two colonies. To do this, Dan and I placed a sheet of newspaper above the third story, cut a few small slits in the paper…and placed the first story from “West” on top of the newspaper. 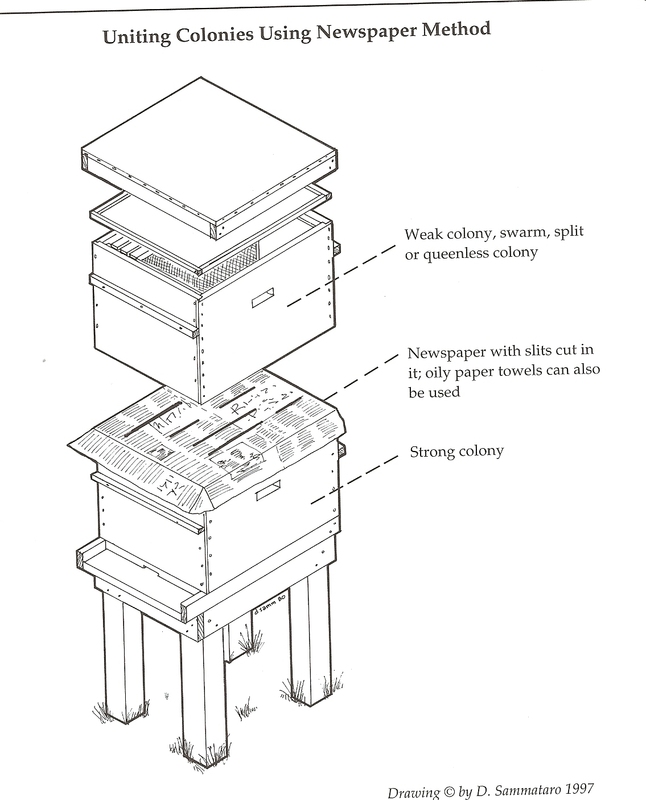 The bees will start chewing through the newspaper, and by the time they get through it ,they’ll be accustomed to the queen pheromones of the strong colony below, and accept the fact that they’ve been assimilated. We hope! Here’s what that looks like. This whole process took us about 35 minutes (Phew!). I’ll go back Friday afternoon, to make sure that the girls have gotten through the newspaper. If they haven’t chewed through, I’ll give them a hand by removing most of the paper. 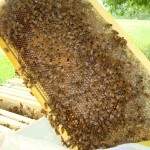 It’s going to be too hot over the next four days and they’ll need a way to get down and out of the hive. (I’m writing this on Thursday evening after attending the monthly beekeepers meeting in Baldwin, and talking to Dan…a day after the merge). This is a common practice with weak hives, and it sort of bums me out that I came up with a “Weakest Link”…But(!) 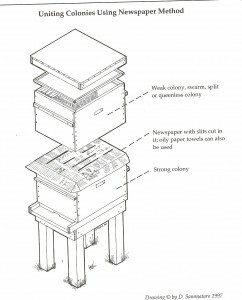 I’m glad that I started my first beekeeping year with two colonies. 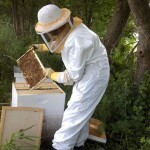 If I had started with one hive, and it was the weak one…I’d be done for the year. The weather has been beautiful, and the one thing that these girls love is good weather. Warm, sunny, light breeze. But I have a concern. The East hive is looking great, the girls are buzzing, queen is laying nicely, and the hive is generally looking really good! West hive is not looking so good at all. 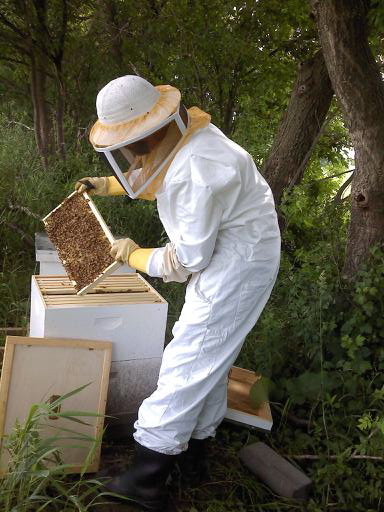 I’m going to call in a Beekeeping Mentor – my beekeeper association in St Croix County Wisconsin has a mentoring system, where experienced beekeepers can be called upon by “newbeeks”…to help out during the first year or two. Let’s see what we find out. I haven’t visited the bees much during the last few weeks, (but last week I did place the second deep box on the East Hive) since I’ve heard that they get cranky when they can’t be flying. But after a nice Saturday, and an exceptional Sunday this week, Cindy brought a camera and we dropped in on the hives to see how things were going. To give you an idea of the activity, I’ve been counting flights arriving and departing in a minute. Last three visits, the count on each colony has been between 30 and 50 (combined flights)…this Sunday, the flights were almost too numerous to keep up with, but I lost count at 90, even before my timer beeped at one minute. 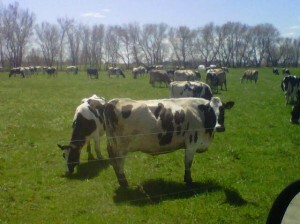 This tells me that the colonies are strong, and the girls are loving this warm, sunny weather. 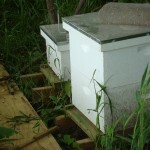 When I looked inside the hives, I expected to see a lot of activity, but I was really amazed at how much was going on! East Hive, which has had the second deep on for a week, I wasn’t so surprised to see good brood production, in fact I had brought some “supers” along, thinking we’d be ready to take East Hive up to the third and possibly fourth stories. The second deep needs to be 70% involved, seven out of ten frames with bees/brood/honey…but East won’t be ready for the third/fourth level for another week, maybe less. The flowers that we’re getting look like mostly clover, with lots of wildflowers starting to bloom out there in the ditches and along the edge of the pastures. But remember that bees will fly out to a radius of about two miles from the hives, so they could theoretically be covering 8000 acres on their foraging flights. Really looking forward to my next visit, when I’m planning to go up another story or two (upper story boxes aren’t as deep, they’re called “supers”, and they’re for beekeeper honey when production goes into high gear). It’s been three weeks since the honeybees were moved in. 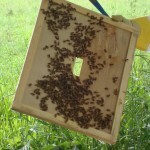 They arrived on 10-May, and the queens came out of their cages sometime around the 13th. I stopped out to check on things on the 15th, and took out the empty queen cages, but didn’t spend any more time in the hive than to take those with me. I’ve inspected a couple of times since the 15th, but I haven’t really seen the queens, I’ve only seen their handiwork. 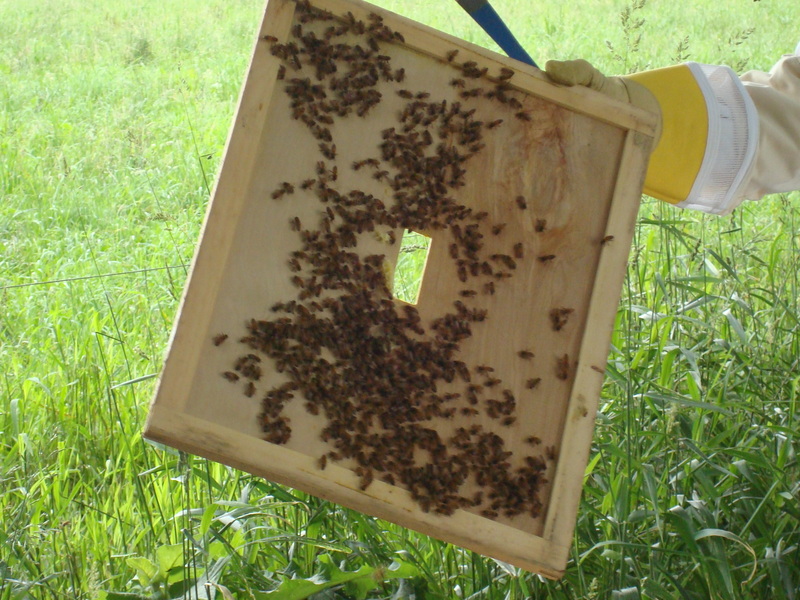 On the 15th, I took out the queen cages, and observed that the workers had already started drawing out comb and filling some of the cells with nectar. That morning I didn’t notice any eggs, but I was a little nervous…so I got in and out pretty quickly. Then on the 26th, I stopped out to see them around 1030AM. The weather was perfect, sunny and warm. Dandelions were in full bloom out in the fields, so the girls were out foraging and bringing back plenty of nectar and pollen. 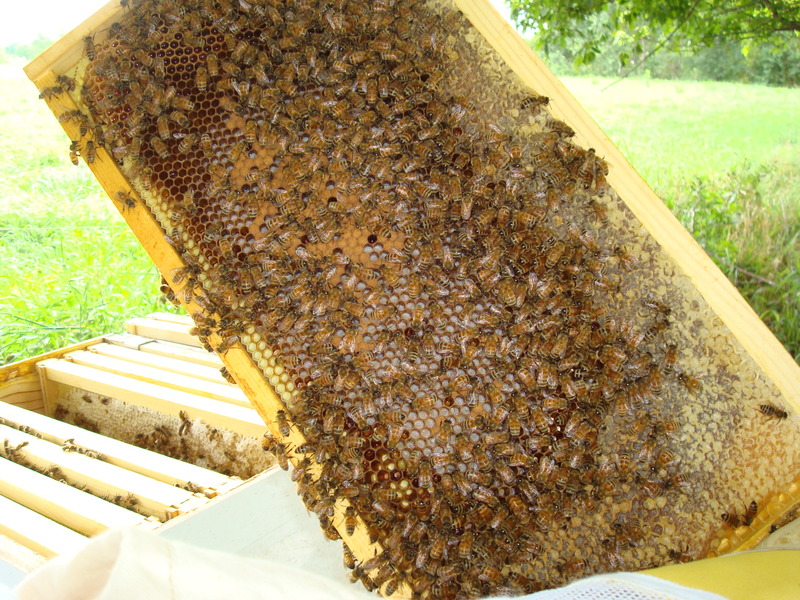 Once inside the hive, I was more patient and took my time inspecting the frames. This time although we didn’t see the queen, I did see eggs (they are tiny little white specks in the bottom of the cells) and larvae (fat white worms curled up in the cells) as well as capped brood (pupae) cells. This was exciting! 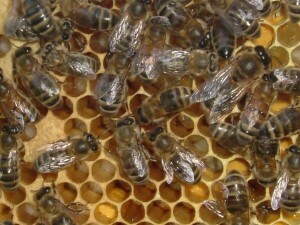 It meant that even though I hadn’t see the queen, she was busy laying eggs and the workers were taking care of the brood. You see, honeybees go through complete metamorphosis. Like a butterfly, they go from egg to larva to pupa to adult. 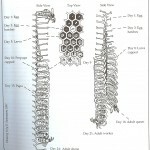 But unlike a butterfly’s caterpillar (pupa) stage…the honeybee spends the first three stages in their honeycomb cell. Only after they are done with the pupa stage, they come out of the cell. At that point, they are fully developed adults, ready to get to work. It was a dark and stormy night…But I’m getting ahead of myself. I got them home just fine in the trunk, and only a few “hangers-on” hitched a ride and found their way into the passenger compartment of the car. No biggie. I knew I needed to wait til closer to sunset to install the bees into the hive, so I waited til about 730 to head down to the beeyard in NewMarket. About 3 miles from the destination, raindrops started splattering on the windshield and heavy clouds were moving in. I could have checked the weather report and waited until the next day. “Could have”. A little rain never hurt anyone! So I got suited up in the beesuit (not the one with the SuperBee emblem), put the car keys into the beesuit pocket so they’d be easy to reach — now, remember this crucial step — and organized my tasks. Open the lids, remove a few frames, open the package, pull the can of feeding syrup, get the queen cage out and check the queen bees. Smack the package to get all the bees off the screened sides, and the pour 15000 humming bees into each hive. Get the covers back on each hive, leave the packages outside the hive so whoever was still in the package would find her way into the hive boxes and start packing up. The rain had picked up some, and I heard cracks, as little hailstones fell through the trees above my head. So I wanted to get moving. I threw my tool bag into the trunk, and sat on the edge of the trunk and pulled off the beesuit, and tossed it in the trunk. As I looked around to make sure I hadn’t left anything lying around, I slammed the lid of the trunk. The next sound I heard changed the rest of the evening. When the lid came down, it closed with a bright “BEEP!” It’s the sound that Cindy and I listen for to make sure the car is locked. Yep. Locked. Four doors and the trunk. I looked around in disbelief that I had waited til Tuesday at rainy sunset to have my senior moment for the day. I had locked the keys and my phone and wallet and all…inside the car. Jeez. Well, the rain was moving in fast, so I decided that if I was going to get anywhere, I was going to have to get some help. So, off I trudged across the chicken pasture, about half-a-mile to the farmhouse, where I was hoping someone might meet me at the front door. Mrs Zweber was in (between chores), and let me use the house phone to phone the AAA. 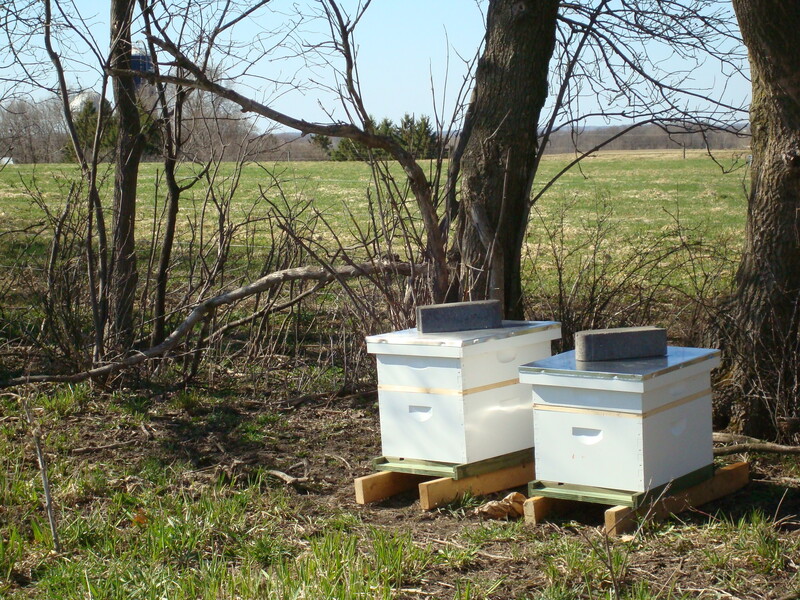 By the time I had given all my car’s location information (300 yards south of the mailbox, and 100 yards off the road in a field), and the AAA girl innocently asked what I was doing in the field (I told her I was setting up some beehives)…I’m sure she was totally confused! What had started out as a quick install, should have taken about 20 minutes…turned out to be a two-and-a-half hour adventure. But I do have to call it a “AAA Rated” adventure. I just got a call from my supplier. Remember Dale drives down to Georgia to pick up dozens of packages of honeybees…and I need to pick them up promptly. Well, he’s on his way home, and I’m on my way over to Wisconsin. I’ll be picking up in Baldwin, WI…and then back to our neck of the woods, to the bee yard at Zweber’s Farm in New Market. Well, I am a little worried about that, but I’ve got my bee suit and veil. Just hope we can keep the girls outside the veil. Stay tuned, things are getting interesting now! More like getting “bee-sy”. After a long month of weather delays (remember, Dale couldn’t get the April17th load of bees til mid-May), I’m getting ready for the girls to arrive sometime this week. Dale (wolf honey farm, Baldwin WI) confirmed that he’ll be back with the bee packages around 10-May. I’ve mixed up the feeding syrup that the girls will need while they draw out the comb before they start foraging for nectar. Tried on …The Bee Suit. Glad I wasn’t being timed trying to get into THAT and zip the veil in place. This would have been worth a video in itself, except there wasn’t anyone around to record me trying to line up the two-way zipper that keeps the mesh veil attached to the neck opening of the suit. Maybe next dry run. Maybe not. The weather up here in Minnesota (Scott County) has gone from cruddy to perfect, almost overnight. Two days in the 70’s, and dandelions are starting to flash their yellow everywhere, elms and maples are starting to break buds, Zweber’s cows are out on the pasture,and you can hear the grass growing. It’s been a long, cold, wet spring, and we’re all ready. I’ll let you know when my girls arrive. I’ve been working with computers long enough to get used to that expression…”Please Wait”. But on Friday this week, I got a call from my honeybee vendor. He told me that due to nasty weather in Georgia (where the bees are being raised), that the girls which were scheduled for April 17th arrival won’t be getting here til around the 12th or 15th of May. Well, we’re ready for Move-In day. 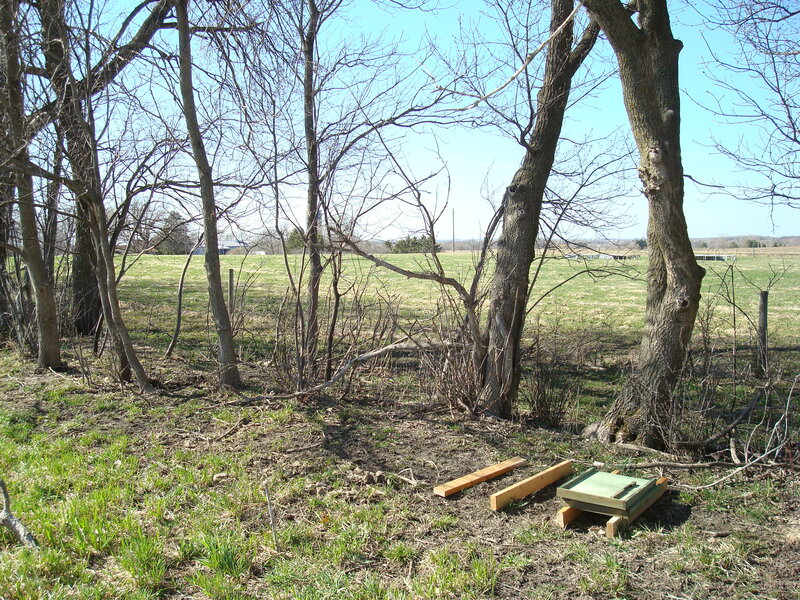 I took advantage of the last warm sunny day for a while, and took out the bottom boards, two deep boxes, feeders and the covers. Tuesday afternoon got itself up to about 78 degrees. By Saturday, we’ll be lucky to get above 35. We start with a basic set up at first. I’m using a pair of 2×4 boards as hive stands. 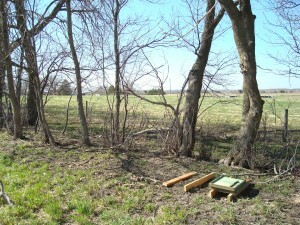 The bottom board is placed next, and then the hive box, containing the wax-coated foundation frames (10 frames per box. 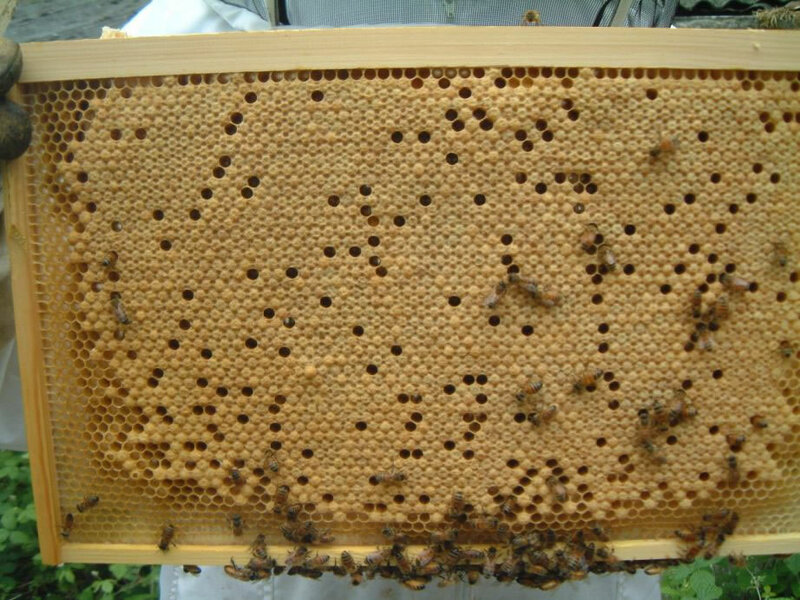 the bees will draw out comb on these foundations). Next comes the inner cover, the feeder and the top, or telescoping cover that keeps out the rain.